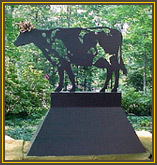 "MOODOSA" is Jim's "homage" to classical art and history. The sculpture is constructed of steel and protected with powder coat finish and gold paint with glass eyes on the snakes. It is about four and one half feet high by four feet wide by eighteen inches. This fountain was commissioned for the Bicentennial Library in Chattanooga, Tennessee. The fountain is constructed of twelve gauge stainless steel in the form of books and is twelve feet high by twenty-two feet wide by ten feet deep, pumping over three hundred gallons of water per minute. "Volumes" Chattanooga's largest piece of public art. 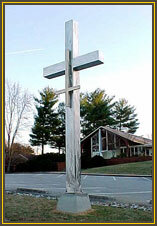 Commissioned for St. Peter's Episcopal Church in Chattanooga, St. Peter's Cross stands seventeen feet high and is made from stainless steel and bronze.